China's deep-sea exploration equipment is expected to systematically explore the South China Sea in 2020, a scientist said on Thursday. The one year global expedition of Jiaolong is scheduled to begin in June 2020 and includes more than 10 countries, mostly along the route of the Belt and Roadinitiative. 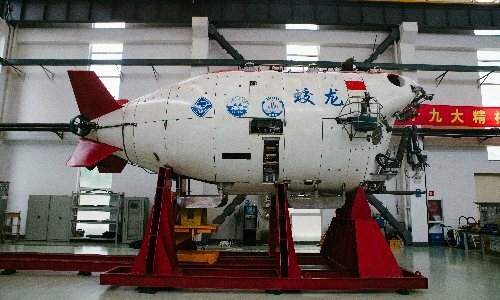 With its advantages in gathering samples in a complicated deep-sea environment, Jiaolong is the perfect underwater vessel to explore the South China Sea, whose deepest region is around 5,000 meters, Ding Zhongjun, deputy chief engineer at the national deep sea center in Qingdao, East China's Shandong Province, told the Global Times on Thursday. Scientists say Jiaolong is capable of diving in virtually all seas to a depth of less than 7,000 meters. The Jiaolong's as-yet unnamed mothership will also carry the unmanned deep-sea research submersibles Qianlong and Hailong that can gather higher-quality data in the South China Sea, Ding said. Drilling facility Shenlong, mining facility Kunlong, information sharing system Yunlong and comprehensive platform Longgong are all also expected to enter operation for joint missions in the South China Sea, Ding said. When the seven pieces of equipment are put into operation, it would make China a leading player in global deep-sea technology, Ding said. The expedition will also promote regional exchanges in deep-sea research technologies, Ding said. The southern South China Sea is rich in resources including natural gas hydrate, an important potential replacement for oil and natural gas. The South China Sea is of strategic importance for China's deep sea development and its exploration would boost the nation's involvement in global deep-sea governance, he noted.